BLM Wild Horse Board Votes to Kill Horses | RANGEfire! 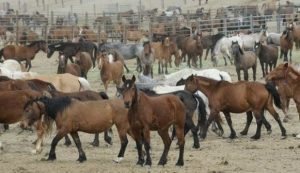 According to Wild Hoofbeats, Bureau of Land Management’s Wild Horse and Burro Advisory Board has allegedly just voted in favor of killing all the wild horses currently in short term and long term holding, approximately 44,000 horses. The only NO vote on the Advisory Board was from Ginger Kathrens of the Cloud Foundation. Being extremely fond of euphemisms, the BLM uses the term “euthanasia” which is incorrect. Definition of Euthanasia: “the act or practice of killing or permitting the death of hopelessly sick or injured individuals (as persons or domestic animals) in a relatively painless way for reasons of mercy.” This is in fact murder, not euthanasia. The intent behind this vote was to send a strong message to Washington, DC so that this might happen. Dean Bolstad, Division Chief had been alluding to killing the captive wild horses earlier in the meeting. This is BLM’s endgame for our wild horses.